I’ve always been annoyed at how I coudn’t find a solid build for my Spellbinder by myself. Spellbinder is indeed usually quite squishy ; AAR Aether or Drain Essence were good enough for leveling and campaign but not for lazy Nemesis/Lokarr Hunt. I decided to go S&B and « all-in » on Aether Damage. Defence is the usual and straightforward Mark of Torment / Mirror of Ereoctes / Time Dilation. Though 1.0.6.0. patch nerfed it, it is still very powerful and you have enough defensive options to wait for the CD to comeback. The result is a 7 aura, almost unkillable, explosive and green Knight with great clear time and good single target damage. 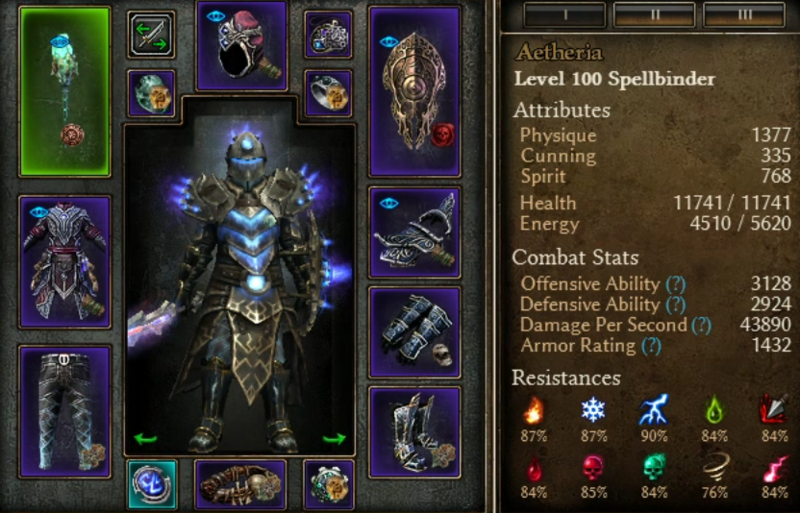 Don’t be fooled by the low hp and armor, it is very solid with good physical res., shield and Maiven/Spectral auras. No new items with FG but component/augment management allows more flexibility. The build gained about 100 DA, 100 armor and +6% total damage. The new mobility skill will hit hard. I haven't played the build for months and tried it again today (03-20-19). MoT + MoE still carries you and Lokarr is still laughable. 4 pieces of the Iksandra Set provides great damage, +skills and physical res. 2 pieces of the Krieg Set. The belt provides 50% fire conversion to Callidor’s Tempest and Aetherfire. Master of Flesh MI for a nice default LMB attack (any Theodin Scepter would work, though some prefix/suffix combo are obviously better than others). Other pieces chosen for Aether damage, RR and some good « when hit » procs. 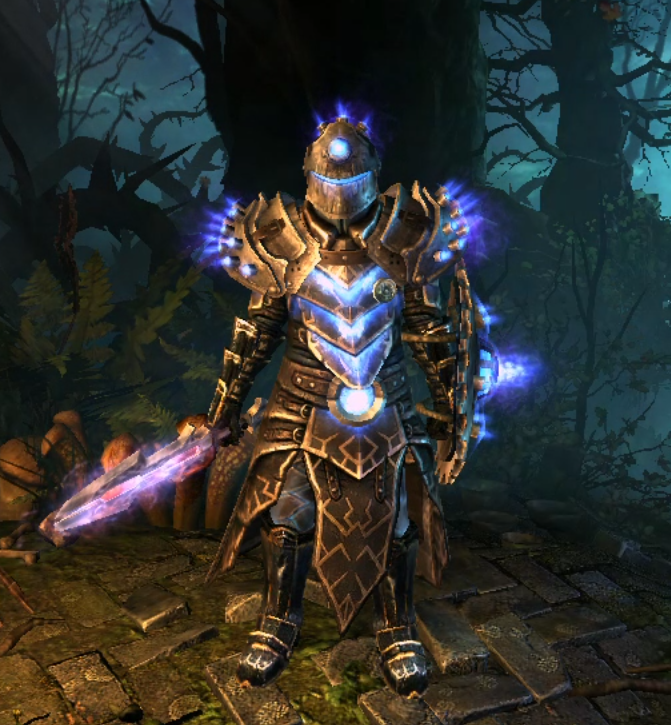 The Shield shines in this build. Arcane Bomb linked to LMB Fleshwarped Strikes. Aetherfire linked to RMB Ather Corruption. Spear of the Heavens does some good work in this S&B Build. Ghoulish Hunger is a good enough safety net besides MoT+MoE. You only need the defensive combo (MoT+MoE) on Nemesis/End Bosses. Callidor’s Tempest hits really hard (over 200K on crits’) and gets rid of everything but elite monsters. Reaping Strike is another reliable source of sustain besides Siphon Soul. Nullification imh is the best utility ability in the game. No MI with the good and right roll needed. Lacks a good DA shredder. I don’t play Crucible so Lokarr is my standard reference. Average kill is 1 min 00 sec. Full lazy facetanking mode. The only danger, as I said, but doable. Preferably, the encounter has to take place in a large area for kiting and hit & run. My only death occured in the second part of Cinder Wastes where it was almost impossible to kite, till I found a big megalith to turn around on my second try. A Mythical Mindwarp + Shard of Beronath for a full no-MI version of the build. If someone could try it on crucible, I’d be glad to know the results. You have one extra point in Reckless Power. You should also max fabric of reality for more flat aether. Foul Eruption is useless on this build, its flat RR is only applied to enemies killed by Acid Earth. You should also take Devastation, great damage support, and you have skill points to spare (like 5 extra points in Elemental Balance for 5% crit damage is a waste). Foul Eruption also provides %health reduction. How can RR be applied on killed enemies ? And what's Acid Earth exactly ? How can I take Devastation with a shield ? With 1.0.6.0., you have to hard cap MoE for CDR. 12/12 isn't enough. Extra points in Elemental Balance for Fabric of Reality is a good point though. I meant Ravenous Earth, duh, so RR from Foul Eruption only applies to mob if nearby mob died from Foul Erruption iirc. So Foul Eruption is only good on Ravenous Earth builds. I am not sure you need those 2 extra seconds on moE on a shield build with Mark of Torment, but if you absolutely need it then sure, hard cap it. So this is what it should look like. Even more flat Aether. EDIT: more improvements: Seal of the Void in weapon for more attack speed and another wps and consecrated wrappings in gloves for more attack speed. Last edited by mad_lee; 05-21-2018 at 12:58 PM. I didn't know this mechanic of Foul Eruption. I cut those points indeed. Necrotic Edge: I had it for a time but I didn't feel the difference when I cut it off from the build, as CT + SS + AC + "when hit" procs are enough for AoE. Resistance cap is why I finally cut Magelord Rings from the build. Or then I would need some good roll MI Pants/boots to fill gap, which isn't the goal of a non-MI build. I just tried your set-up but Chaos/Vitality res. are nearly impossible to cap without taking some defence off (components/augment). Lokarr felt more difficult, I couldn't facetank all the fight. Seal of the Void seems interesting. Consecrated W.: Restless remains is the only lifesteal source besides the frog constellation. Points in IEE make sense too indeed. It needs more testing then but the raw concept (S&B Aether CDR Spellbinder) works fine. I've updated the grimtool link, including some relevant changes proposed by mad_lee, whom I didn't thank properly for his time taken to analyse my build. I think max Elemental Balance for Crit is nice. Siphon Soul could be cut a little indeed. I need to do a few test runs in Ancient Grove for more feedback. Second grimtools link added, for a Magelord set up.